Isber Sabrine from Heritage for Peace and Francisco Jose Rufian from UNESCO – Getafe-Madrid Center presented their work on ‘Cultural heritage as a tool to promote peace in El Salvador, Mexico and Columbia’ in the international conference ‘5ta Jornada Internacional de Paisajes Patrimoniales” which took place on the 8th of November. Go here to learn more about the conference and go here to see the program abstracts. 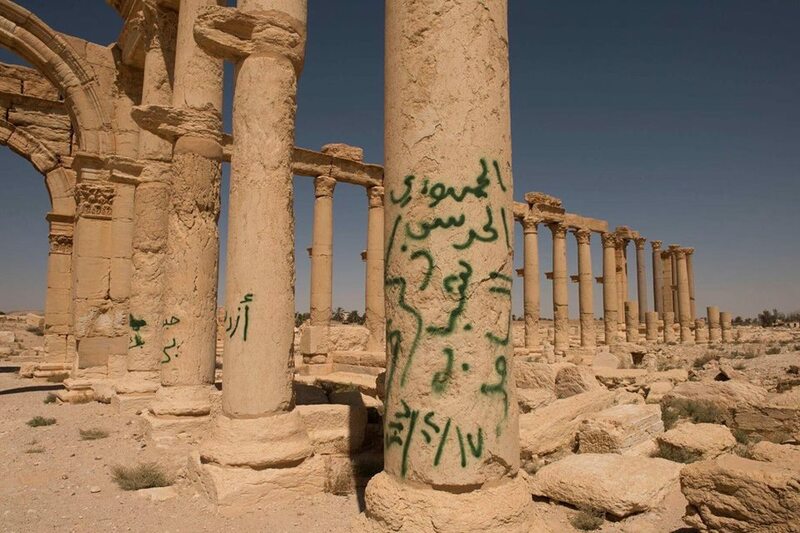 Photo of alleged graffiti at Palmyra. Source: Palmyra, Ghouta, Idleb etc. Syria News Updates Facebook page. The Comal Heritage Food Incubator in Colorado is giving Syrian women the opportunity to take their own family recipes and elevate them for the restaurant and catering business, according to 303 Magazine. Business activity is resuming at the old market in al-Bab in Aleppo, as shopkeepers opened their doors to customers for the first time in two years. Read more on Al-Monitor. The al-Midan Cultural Center is exhibiting a collection from the library of Mohammed al-Masri (Abu Farid) of rare records, antique musical instruments, and photos and books on the history of music in Syria. Learn more on SANA. In April 2018 Syria issued Law 10, which sets guidelines for the creation of development zones over existing urban areas. The Aleppo Project recently interviewed Edward Hanna from Syrbanism about their recent survey of property types in Syria to assess the threats new regulations pose to displaced owners. Read more on this at the Aleppo Project blog. The Aleppo Project also wrote about Syria’s new property law, questioning it it incentives the diaspora’s return or will be used to confiscate the property of absentee Syrians. Restoration work has been carried out at the archaeological mission house in Tell Beydar as part of a series of maintenance and restoration operations carried out by the Authority of Tourism and Protection Antiquities in Al-Jazira province, conducted during two seasons of work at the archaeological site.The new stage includes the maintenance and restoration of the scientific complex where the archaeological mission was located, which was originally constructed as a model of the mudbrick architecture that was prevalent in the area during the second millennium BC. The maintenance process started on 10/11/2018. As a first stage of the Action Plan prepared by the Authority it will be implemented in stages through its own scientific team. The start of the first phase of cleaning and preventative maintenance at the Castle of Sakra was carried out by the Authority of Tourism and Protection Antiquities in Al-Jazira province in Syria, reported on their website. Digital Apamea is both an actual and virtual exhibition in which digital technology is employed to reconstruct the ancient 4th Century synagogue mosaic floor at Apamea on Orontes in Syria. Learn more at Digital Apamea. Syrian-American artist Leila Khoury is recreating historic areas of Syria in metal and concrete. You can read more at OZY. Preparations are almost complete for the ‘Syria Matters’ exhibition organised by the Museum of Islamic Art (MIA) as part of its 10-year anniversary celebrations. The exhibition is the first of its kind in the region and is due to open to the public on November 22, according to the Qatar Tribune. Refugees and migrants from countries including Syria and Iraq have been given volunteering jobs as museum tour guides in Oxford, according to the BBC. A photo exhibition entitled ‘Syria, the Pearl of the East,” featuring photos of Syria’s cultural and natural sites, recently opened in the Cultural Center of Jaszfenyszaru town in Szolnok county in Hungary, reported in SANA. Chosen as a writer deserving support by the International Cities of Refuge Network (CORN). Syrian poet Kholoud Charaf has been granted a two-year residency in the Polish city of Krakow to work on her poetry and prose. Read more on the UNHCR. The Shattuck Center invites experts and young scholars to submit papers to present at the 5th annual Lemkin Reunion for March 19-20, 2019. For more information go to the Shattuck Center. The “Mediterranean Stock Exchange for Archaeological Tourism”, held 21 years ago in the city of Pestom in southern Italy, has announced the names of the five most important archeological sites discovered this year and the “Khaled Al Assaad Best Archaeological Discovery of the Year” award. The list included three sites from Arab countries, In addition to a location in Italy and another in France. The award was founded at Pestom in cooperation with a number of international scientific and archaeological figures. You can read more on Hunaroma. ABC published a short audio report here about the recent reopening of the national museum in Damascus. The Gulf Times reported on the upcoming ‘Syria Matters’ exhibit at the Museum of Islamic Art in Doha. The “L.I.S.A” posted on their website here about the urban and social history of the Umayyad Mosque of Aleppo. Polish renovators and archaeologists have restored the Lion of Al-lat statue in Palmyra. Read more on The First News. The British Museum’s new exhibit called “I am Ashurbanipal:King of the world, King of Assyria” and it runs from November 8th, 2018 to February 24, 2019. You can learn more about it at The British Museum.